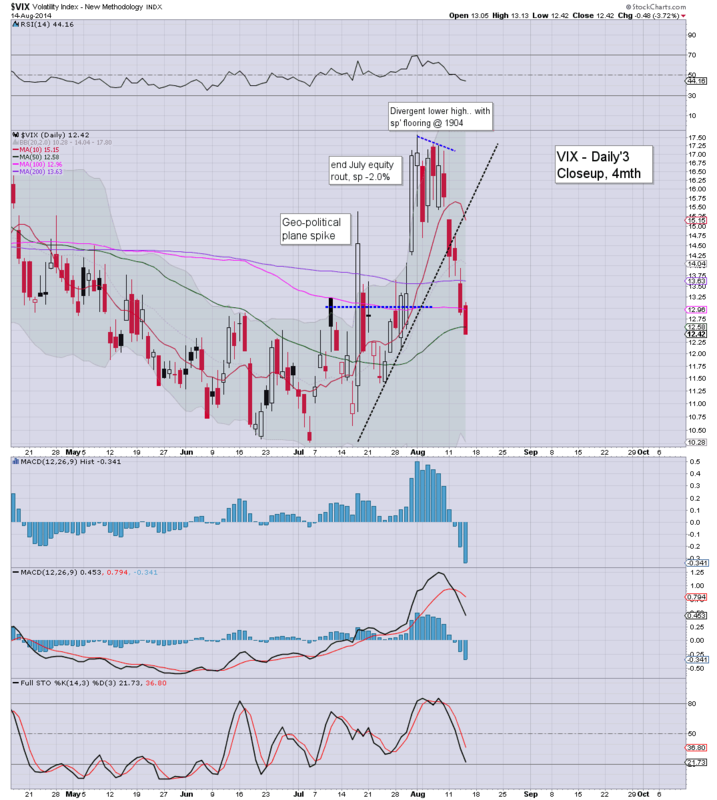 With equities still climbing, the VIX continues to melt lower, settling -3.7% @ 12.42. 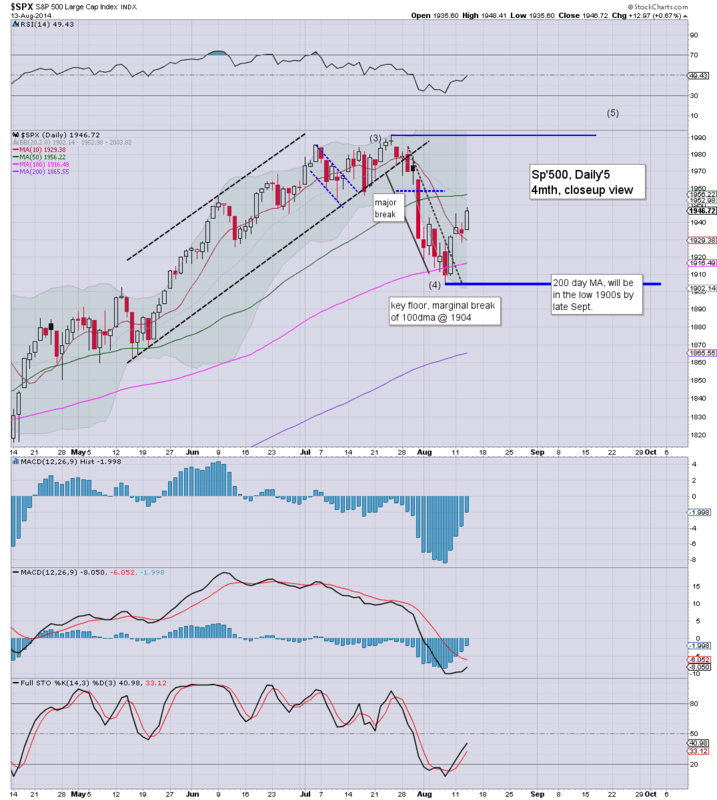 Near term outlook is for a weekly close in the 12/11s. The 10s.. or even 9s are likely if sp'2000s. VIX 20s look unlikely until at least early October. VIX remains set to continue slipping.. as equities claw towards new historic highs. US indexes closed higher for the fourth day in five, sp +8pts @ 1955. The two leaders - Trans/R2K, settled +0.7% and +0.1% respectively. 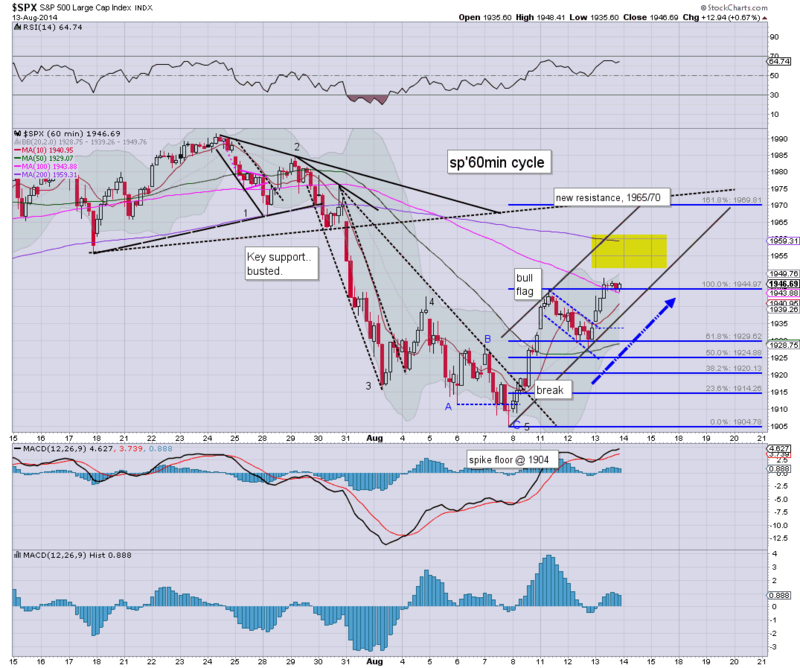 Near term outlook is for sp'1965/70 zone, before the first chance of a minor retrace. The 2000s look very likely in September. A pretty tedious day, but then..most up days are. 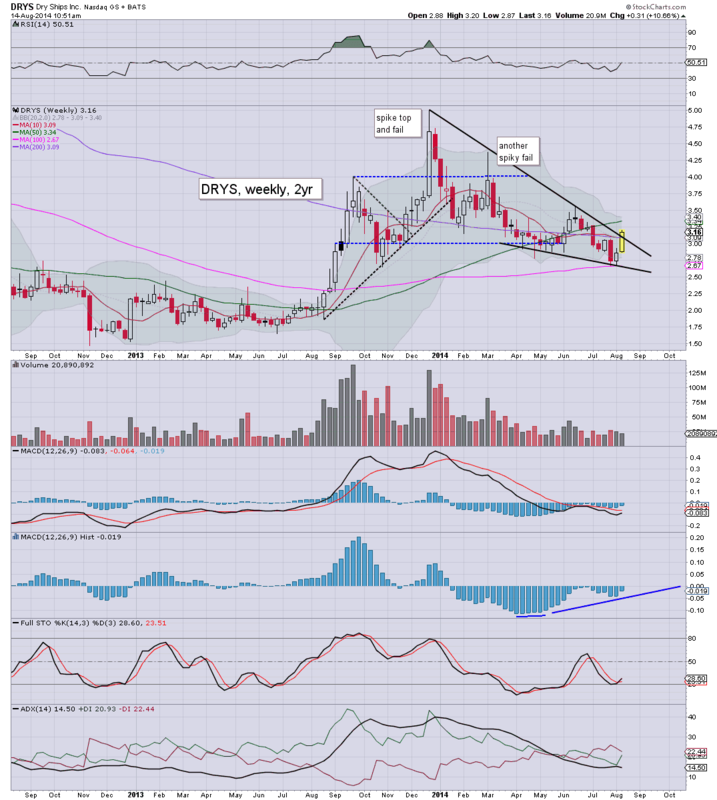 Tomorrow is opex, and normally I'd look for chop across the day, but the near term trend is for further upside. *I hold LONG overnight...seeking an exit into the weekend, from sp'1965/70. US indexes are set to close higher for the fourth day in five. Equity bulls have fair opportunity to claw higher tomorrow (not least if the EU indexes see morning gains)... current target zone is sp'1965/70. Little to add.. on what is another tedious day. Daily MACD cycle on the sp' is set to turn positive at the Friday open..and a break above the 50 day MA looks very likely. *Oil remains notably weak, now lower by -2.4%... a pretty major drop.. but more on that later..
What remains bizarre is seeing continued (if lessened) talk of the sp'1800s in the 'immediate term'. After all, the geo-pol events are going to 'blow up' the market, right? Just yesterday, there was near hysteria about some truck convoy that was going to cause all sorts of problems. Equity bears are powerless...but then..what else is new. US indexes hold moderate gains, with a VIX that is entirely reflective of a much calmer market. Friday is opex, but there looks to be high opportunity for continued melt into the sp'1965/70 zone... at which point we'll likely get stuck. The 1.6x fib extrap of the wave from 1904/44 - offers the 1970 threshold. That seems a very viable 'best case' tomorrow. I suppose it could drag out into next Monday - with an intraday reversal, but my guess is we'll see 1960s tomorrow. It remains tiresome...despite being on the right side of the current trend. US equities continue to relentlessly claw higher. The Dow is +44pts, with the 50 day MA still 160pts to the upside. Dow 16850s would equate to sp'1970. Oil has continued to weaken, now significantly lower by -1.7%. Market is in melt mode.. and there are doubtless a truck load of short-stops in the sp'1954/56 zone. High chance of those being triggered this afternoon... which might result in a daily close around 1960. As things are... I intend to hold long overnight..but will look to exit into the weekend. 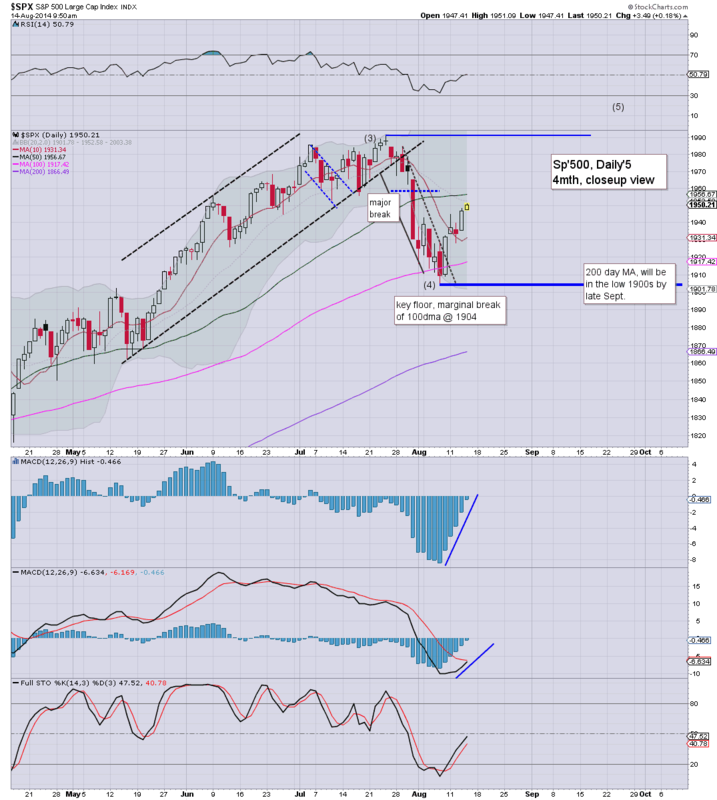 US equities remain moderately higher, with the sp' still to test the 50 day MA of 1956. The daily MACD cycles are in the process of turning positive for the first time since July'7. VIX remains subdued in the 12s. Bears are powerless..whilst it seems just a matter of when we'll hit 1956...and then probably keep on going into next week. *the IHS pattern that some are suggesting, offers the 1980/90s next week... although I'm still cautious that 1970 remains 'best case' in the current wave.. before a minor retrace. Without getting lost in the minor noise (urghhh)... daily cycles are now now turning positive. Simply put... we're arguably only half way in the current up wave. *I continue to hold long, now seeking an exit in the 1960s.. whether late today..or tomorrow. The $4 threshold is starting to look a rather easy target. As the lightning bolts start to rain down in London city, we've already moved into the 1950s, and the 1960s are within range late today. Most notable - at least to me, the daily MACD cycle. We haven't even got a bullish cross yet..and the MACD is not even positive. There is easy opportunity to climb for another few days.. which would get us to sp'1970. Notable strength: airlines... DAL, UAL... - see my 'fair value' post for more on those. 10.29am... DRYS $3.20.... breaking out... on its way to $4 in September. Transports are flat overall, but look set for net daily gains. Good morning. Futures are moderately higher, sp +4pts, we're set to open around 1950. A break of the 50 day MA @ 1955 looks likely this morning, with further upside into the 1960s. Price structure on the hourly chart is offering a baby bull flag, and right now, that looks set to be confirmed with an opening gap higher. *I remain long, but will certainly be looking to exit today, and would intend to sit on the sidelines until next Mon/Tuesday. 8.52am.. Notable early weakness, FCX -1.2%... not sure why, maybe its falling Copper prices. sp' futures back to largely flat. Regardless, we should still battle higher this morning. 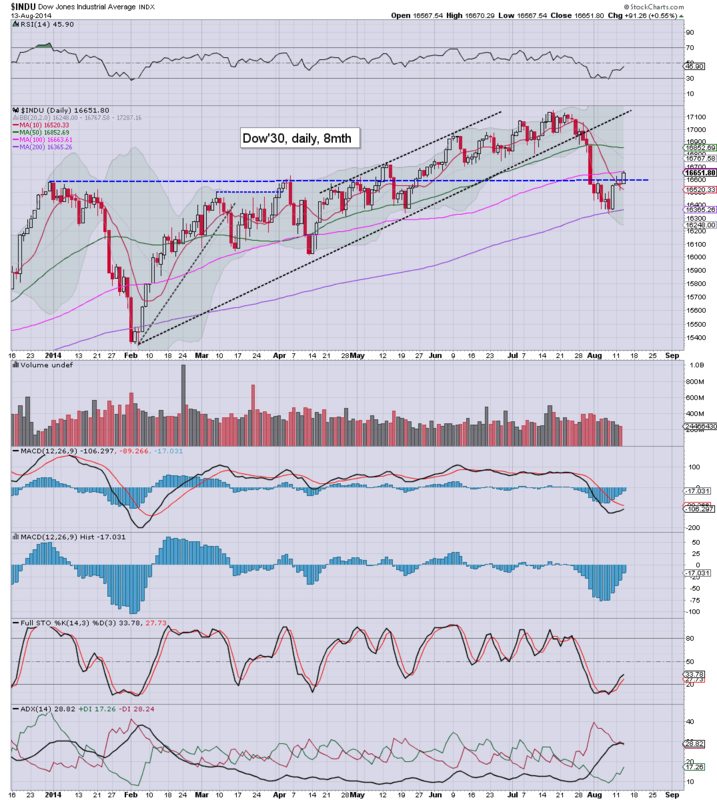 US equity indexes climbed for the third day in four, and the bigger weekly cycles are looking increasingly bullish. A break above the weekly 10MA would bode for a straight run into the 2000s in late Aug/early Sept.
With the break back into the 1940s, the weekly 'rainbow' candle has turned back to blue. 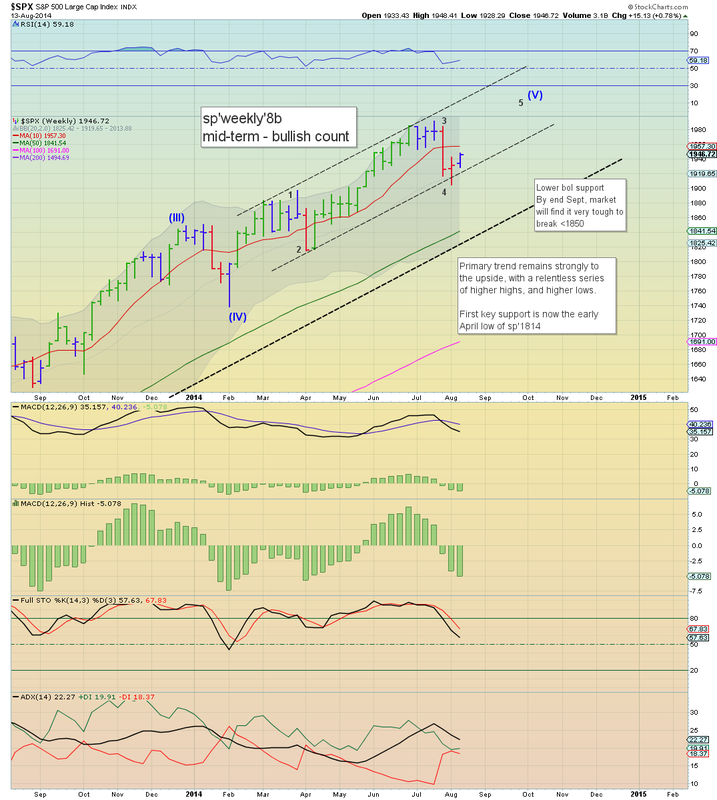 Equity bulls should be content with a weekly close in the 1940s, but with price momentum as it is, Friday will likely settle somewhere in the 1950/60s. 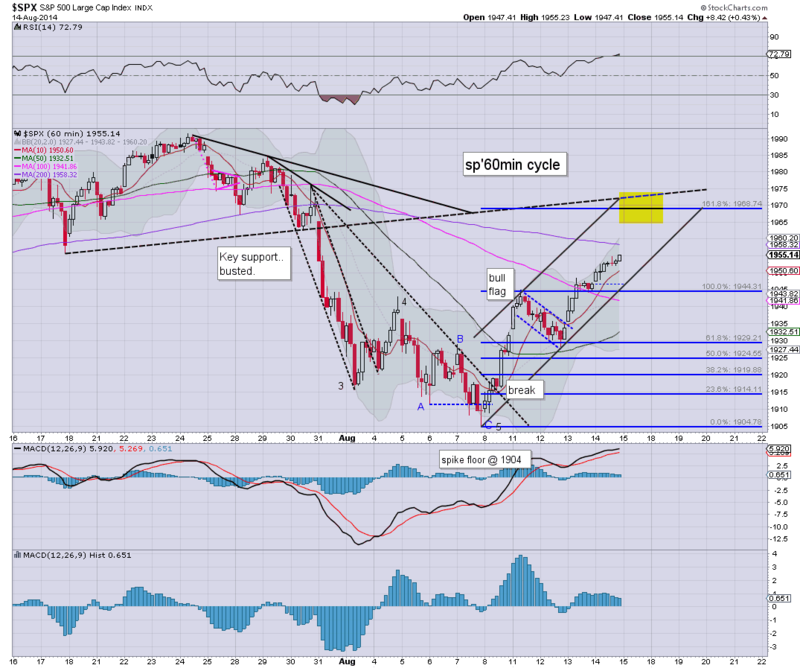 It is highly notable that the upper bollinger on the weekly cycle is already offering the 2010s in the immediate term. However, I would guess the 2000s won't be seen until next month, even though we are now just 2.6% away. The following is just one of a number of scenarios I am keeping in mind for the autumn, but I have to admit.. it is a personal favourite. On any basis, downside to the mid/low 1700s would be a valid target. A 'natural back test of the 2000/2007 top' to the sp'1625/1575 zone looks damn difficult.. but still, if the downside is powerful (with VIX at least in the 30s)...then maybe its possible. Jobless claims, import/export prices... in the scheme of things...not much. *there is sig' QE of around $1.5/2.0bn... bears beware! 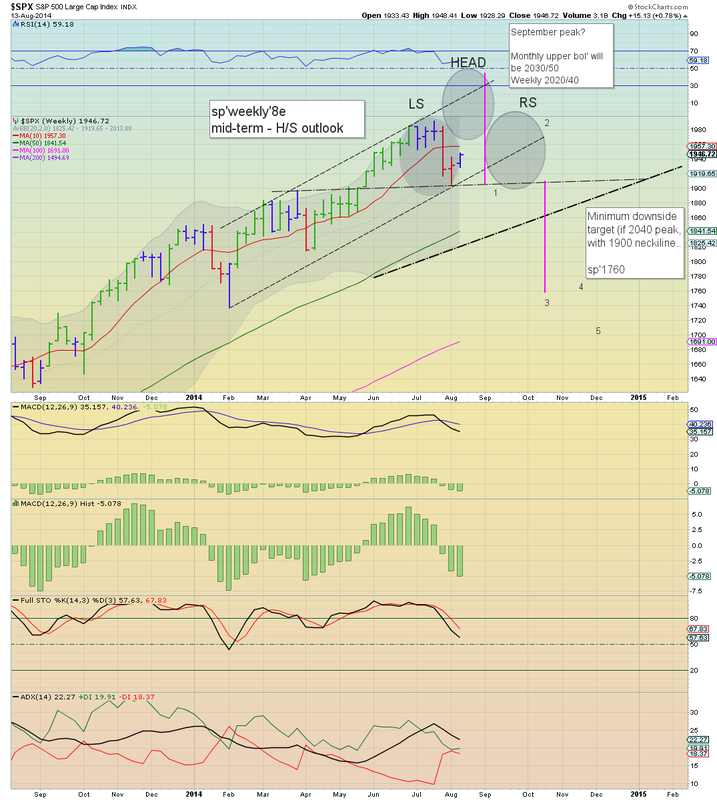 Yours truly remains long (from sp'1937), and considering the daily MACD cycles, I decided to hold overnight.. despite some mild concern that German GDP (due Thursday morning) might be a problem. As things are, I will endeavour to remain broadly long until mid/late September... to the sp'2030/50 zone. US equities closed moderately higher, sp +12pts @ 1946. The two leaders - Trans/R2K, settled higher by 0.7% and 0.8% respectively. Near term outlook is for a break through the 50 day MA of 1955, which will open up the 1965/70 zone by the Friday close. Suffice to say, last Thursday's low of sp'1904, and perhaps more notably the overnight low (equivalent to sp'1892), are increasingly fading below. It would seem highly unlikely that we'll break into the 1800s in the near term - as especially reflected in the VIX. The only issue is where will the market get stuck... 1955, 65/70, the 1991 high.... or can it just keep on pushing straight up into the 2000s? Best guess... 1965/70... a minor retrace..and then busting through 1970 on the second attempt.